I have started to dive into the Ultimate Portion Fix Certification and have already learned so much. 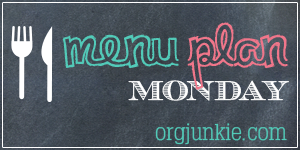 This week’s menu is built on the Ultimate Portion Fix Meal Plan and based on the Foundational Fix path. We are back from vacation and I’m actually craving some home cooked meals. I’m taking a break from counting containers and following the portion control meal plan this week. But I will be back to it soon as I start the certification for Ultimate Portion Fix.